At Walley Plumbing Company LLC, we have experienced plumbers who will offer “Good Old Fashioned Customer Satisfaction”. Customer service is our priority. We have established a solid reputation as a trustworthy, professional and knowledgeable provider. We are a locally owned and operated company. We know how valuable your time is and we strive to accommodate your needs in a timely manner. As life-long residents of Mobile, we respect our community and surrounding areas as well as the people in it. We want to establish a business relationship with you that will last a lifetime. Give us the opportunity to prove our quality craftsmanship to you. Our job is to solve your plumbing needs. 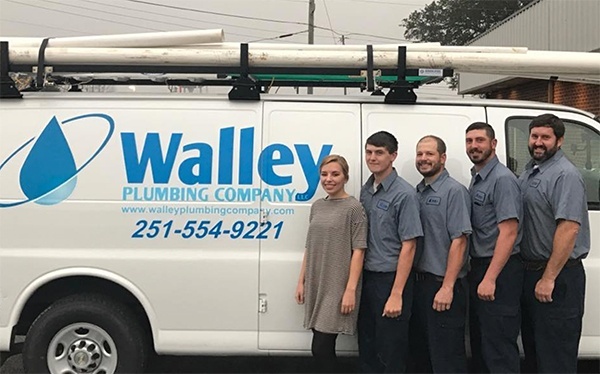 Be assured, Walley Plumbing Company LLC maintains the highest business standards and constantly strives to improve every aspect of its service to our community. Walley plumbing is a proud member of the Alabama Home Builders Association. But don’t just take our word. Let us earn your business. Give us a call at 251-554-9221.